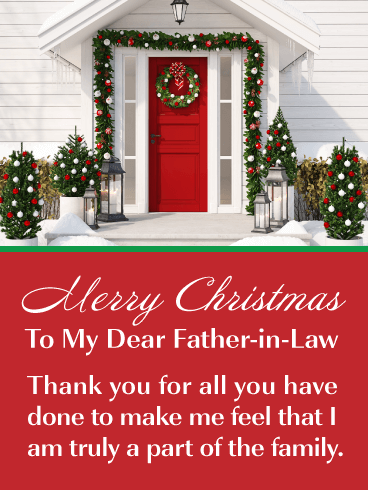 Let your father-in-law know that you are thankful he is in your life with this thoughtful Merry Christmas card! Its bright red and green colors, fancy Merry Christmas lettering, along with the snowflakes, sparkles, and Santa hat, give it a delightful holiday look. Your father-in-law will be thrilled to receive such a great Christmas card from his daughter-in-law. Don’t delay, wish him a Merry Christmas today! Merry Christmas. 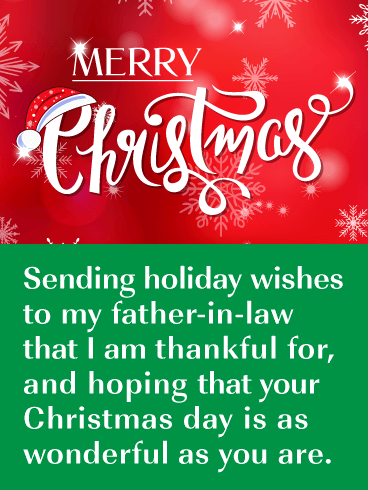 Sending holiday wishes to my father-in-law that I am thankful for, and hoping that your Christmas day is as wonderful as you are. You can’t go wrong with a creative and unique Merry Christmas and Happy New Year card such as this! 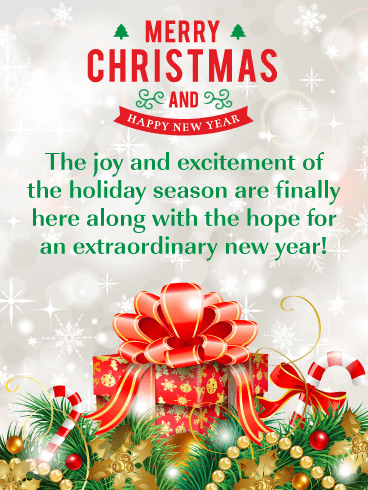 It has sensational colors of green and red, along with terrific holiday icons, and a thoughtful message! A cute snowman, a dazzling Christmas tree, and of course, Santa and his reindeers are spotted in this holiday card and they look awesome! 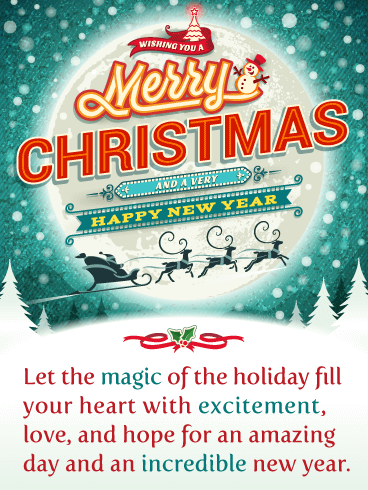 Remind someone to let the magic of the holiday fill their heart with this impressive Merry Christmas and Happy New Year card! The holiday season is here and it’s time to send a little joy to those you care about most! 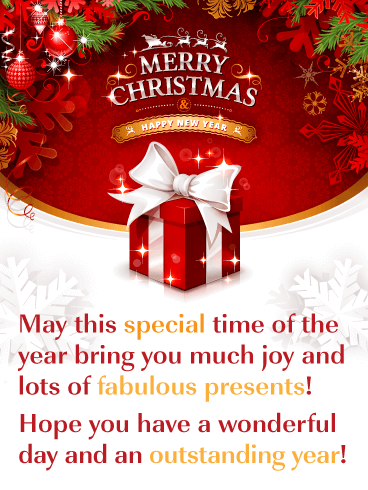 This gorgeous Merry Christmas and Happy New Year card will add excitement to the day of all who receive it. It contains a sensational holiday gift box surrounded by decorative Christmas tree branches and candy canes. The sparkling background has a snowy look and the creative Merry Christmas and Happy New Year lettering look outstanding! 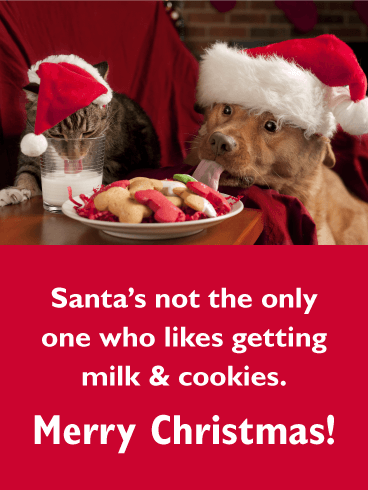 Send this amazing holiday card out soon! 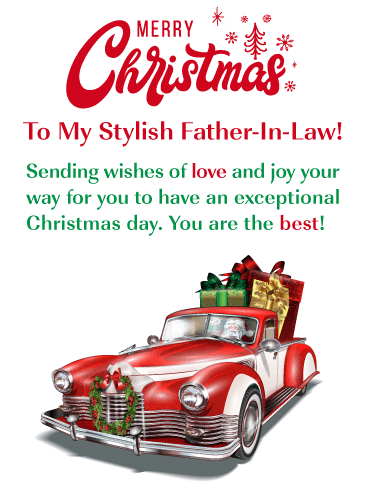 If you have a father-in-law who likes classic cars, then he is going to love this Christmas card! It features a fabulous car decked out with a Christmas wreath and colorful holiday presents. It appears that Santa is making his deliveries in style, and it makes for a terrific Christmas card! So send this awesome holiday card over to your father-in-law right away so he can enjoy this classic car on Christmas day! 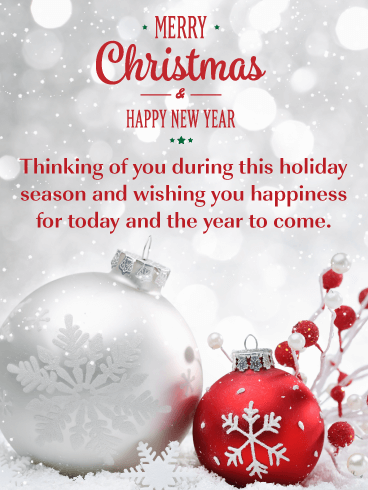 This classic Merry Christmas and Happy New Year card has an elegant look that will surely capture the attention of the recipient. Magnificent holiday ornaments of red and silver are set against a wintery scene that is so familiar during this time of the year. 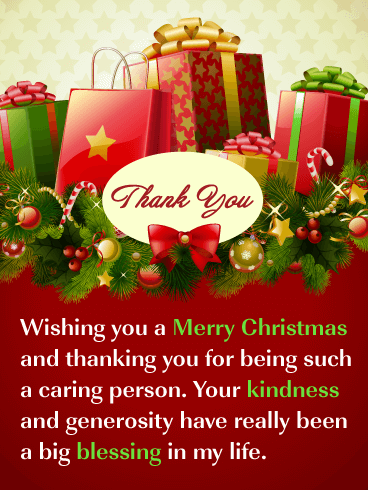 The message will let them know you are thinking of them during this holiday season. 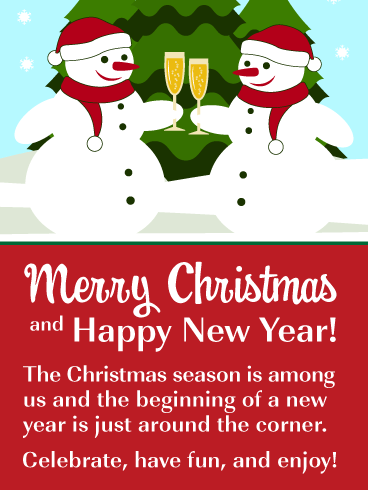 Send this exceptional Merry Christmas and Happy New Year card out today so it can be enjoyed without delay! A stunning gift box with a lovely bow set the stage for this amazing Merry Christmas and Happy New Year card. Beautiful Christmas ornaments are also seen and add a special holiday flair. 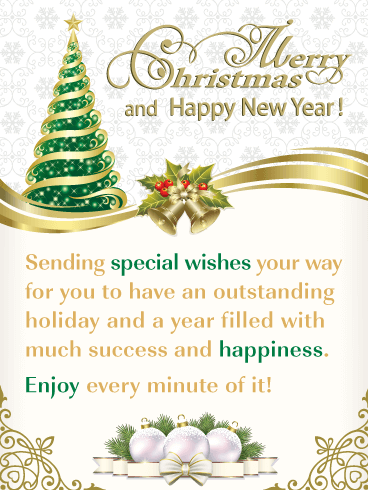 The words Merry Christmas and Happy New Year are displayed in a fantastic fashion that creates a stylish look. Make sure to send this holiday card out today to wish someone an outstanding year and a wonderful day! 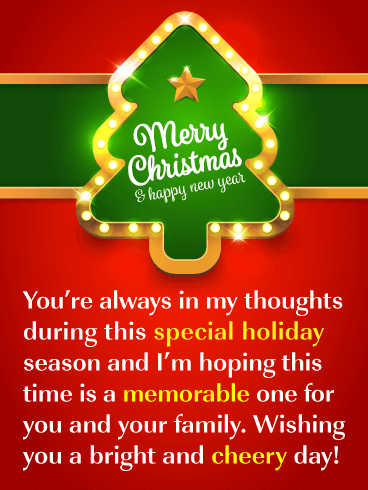 Wish someone a joyous holiday with this great Merry Christmas and Happy New Year card! It was designed with a beautiful red Christmas ornament tied to a bow. It’s surrounded by winter snowflakes and displays the words Merry Christmas & Happy New Year. 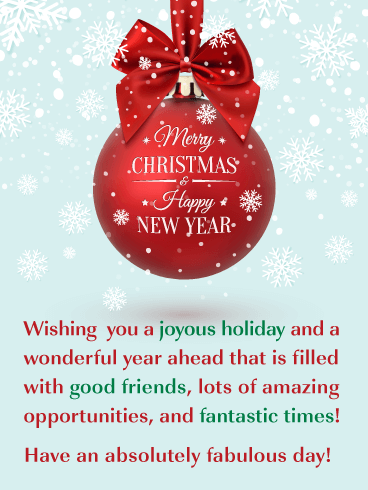 This holiday card’s message wishes someone a year filled with good friends and amazing opportunities! So send this stunning card on its way to wish someone a fabulous day! They will certainly appreciate it.